Last night, I went on a 25 mile ride. I have a couple triathlons this summer that I would like to do – starting with one on June 12th. I’ve done duathlons before, but this is my first time tri-ing. Anyway, I really enjoy long rides or runs over short & speedy sessions because I can somewhat zone out and clear my mind – I don’t have to keep an eye on a watch. Caitlin at Healthy Tipping Point did a really nice post about long rides/runs/swims/whatever being relative and more mental than physical and I definitely agree. Today was slow at the office and I decided to skip a run and stretch instead. Since I had a teeny tiny bit more time than usual, I made one of my favorites for dinner: kale chips. I’m so so grateful to the person that invented kale chips. I mean, who would have thought to put a green in the oven? And who would have thought it actually tasted like a (healthy) potato chip? I simply washed a head of kale, tore it into bite size pieces, and salad spun it until it was dry. Then I spread it in a single layer on a baking sheet lined with foil and sprayed with olive oil and sprinkled with kosher salt. Popped into the oven at 350* for about 15 minutes, until crispy. 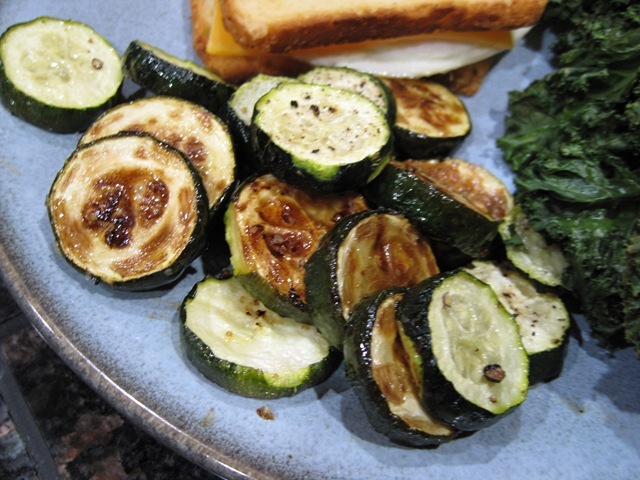 To go with my little green pieces of heaven (not to be confused with the gift from God: brussels sprouts), I sliced up a couple zucchini to make zucchini chips. I don’t know why I call these ‘chips’ – they really are just baked zucchini rounds. I’m sure other people have gotten them to be chip like, but I can’t get them to be anything other than rounds. Good rounds, though. To make, I simply sliced, olive oil sprayed, salt + peppered, and baked 350* for 35 minutes. And my new food boyfriend? Kinnikinnick Tapioca Rice bread + 2 eggies + slice of cheddar + a little mayo. I have another hour or two of work before I can pull out the wine + chocolate chips and zone out to TV. I’m sure you’ve posted it somewhere, but can you tell me how you bake your potatoes and sweet potatoes? For sweet potatoes, I peel and cut into half moons about half an inch thick, brush on a little olive oil and sprinkle with garlic powder, then bake at 350* for 30 minutes and then 400* for 10 minutes. Something about cranking up the temperature at the end makes them amazing. For regular potatoes, I start the same way as sweet potatoes and then bake at 350* for 55-60 minutes. Good luck with the kale chips! Mine are still a bit more squishy than chip-like, but I roast my zuccinni (all my roasters actually) at 450* for 20-25minutes. Maybe if you up the temperature a bit you’ll get the texture you are looking for. 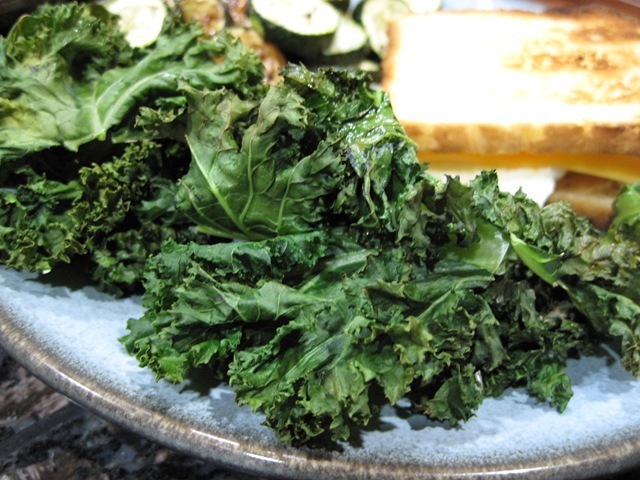 this just reminded me that i need to make some kale chips soon…those things are SO addictive! 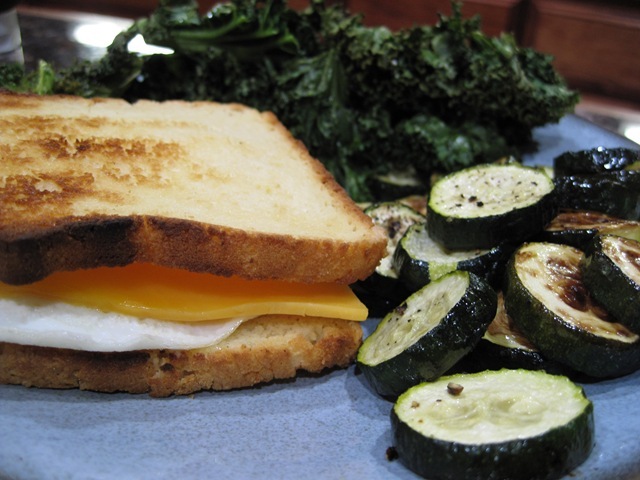 Kale chips and egg sandwich! I’d totally go for that! I love kale chips. I can even get my green-hating husband to like them! Haha! I’m that way with my turkey bacon/cheese sandwiches on Food for Life english muffins. They’re so good and so addictive. The ride sounds inspiring. I ought to give something a try like that.